I recently became involved with - and more importantly, started using - the best Belgian-style loafers I have ever worn. 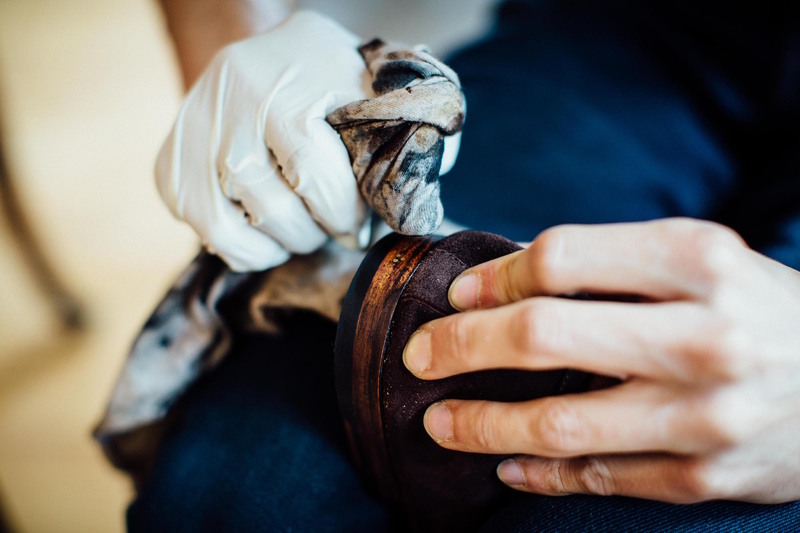 They are made by Allan Baudoin, a French bespoke shoemaker who now lives in England and has a workshop in east London. The Sagans - as they are called - are the first thing to come out of his new ready-to-wear brand, Baudoin & Lange. A Belgian loafer is a fantastically useful shoe. Part way between a slipper and formal loafer, it is smart around the house and casual in the office. 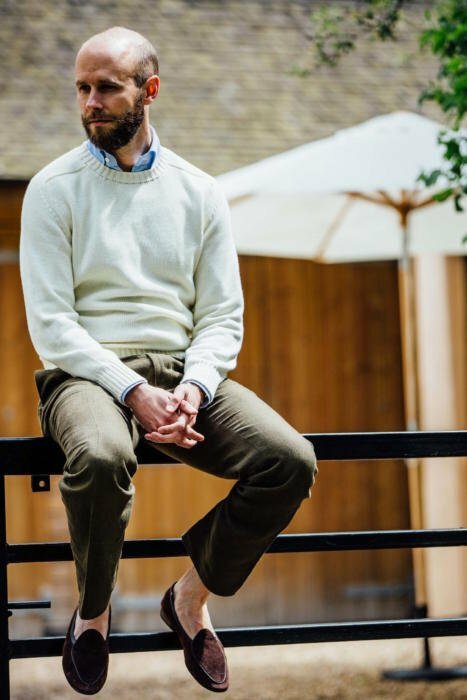 Although it has little internal structure and only a light leather sole, you can still happily wear a Belgian loafer outside - down to the cafe or out to a local dinner. I wouldn’t commute in them every day, but I do wear them frequently in warmer weather with formal clothing (see Pitti post here) and they are great to keep in the office, given I cycle in most days. The Sagans are distinct from other Belgian loafers in several ways. 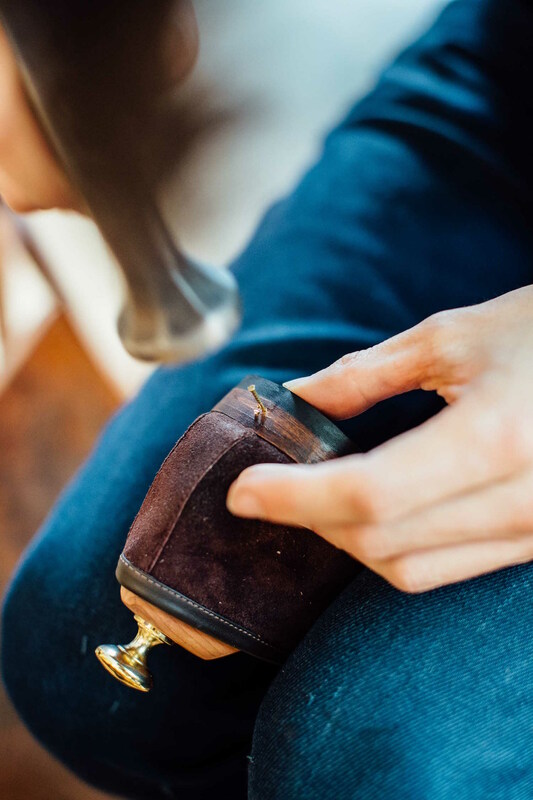 Most importantly, they are made of suede lambskin, rather than the calfskin normally used in Belgians and other dress shoes. Lambskin is most commonly used in gloves and leather jackets, and is softer than calf. You feel that softness immediately because the Sagans are unlined. Again, most loafers (though certainly not all) are lined with another layer of leather, which gives them greater structure but reduces the softness. Lambskin isn’t usually used in loafers because it is often poor quality and is too delicate for more structured shoes. Fortunately, Allan has been able to source small runs of very high-quality lambskin from a tannery in Cyprus. The second thing that sets the Sagans apart is their quality of make. 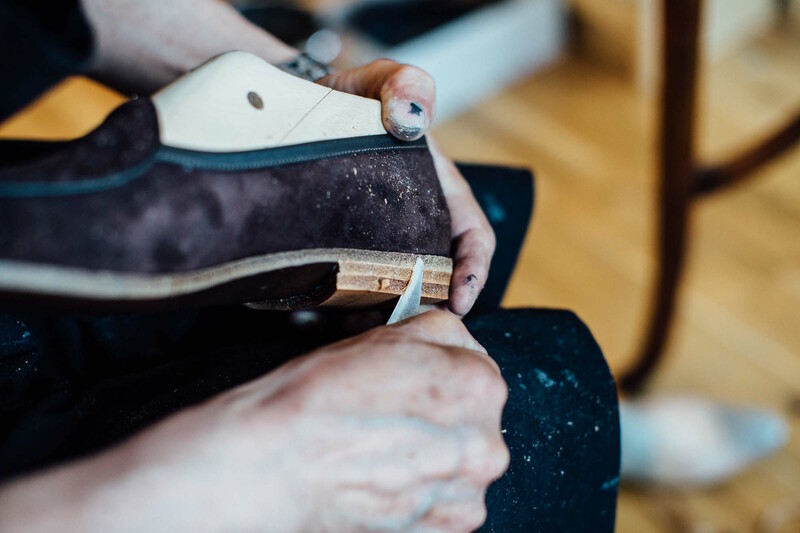 Allan’s background is as a bottier and although these are nothing like bespoke shoes, they carry across some of this attitude to quality manufacture. For example, the leather binding that runs around the top of the shoe is finished by tucking underneath itself, leaving a neat line of leather around the outside. (Indicated above.) All Belgians and most dress loafers just cut the leather at this point, leaving a raw edge. The sock is also French calf leather - softer and more breathable - and the insoles are hand-cut leather, rather than composite cardboard. That insole has a cushioned insert which makes them very comfortable: an actual insole lasted with the upper, rather than just padded socks. High-end dress shoes have many of these details, but Belgians tend not to, and any shoes rarely do at this price point (£245). The shoes are also hand-lasted, which is useful with the lambskin to help control the tension around the shoe in such a soft leather. On that point, one thing that I found striking about the Sagans is their ability to adapt to lots of different foot widths. Although they are built on a relatively slim, elegant last, the softness of the lambskin and the fact they are unlined means they can stretch to particularly wide feet, and remain perfectly comfortable. My feet are a little narrow - usually E, sometimes D - but they fit me very well, and I’ve seen them fit people with much wider fittings too. In a casual shoe like this, which is rarely going to come in several widths, this is an important factor. I’ve been wearing my Sagans for several weeks now, and they were particularly useful in the couple of hot weeks we had in May. They're designed largely for internal use, but can be worn outside (with care). I used to wear Rubinacci Belgians - those are the ones shown in Florence last summer. But when I pick them up now they feel so poorly made by comparison. The Sagans have been available for a while to Allan’s bespoke clients, but are being relaunched at the moment - with several improvements like the cushioned insole, thin toe puff and heel counter, and a nice three-nail design in the heel which has become Baudoin & Lange's trade mark. On the site at the moment there is purely a form to register interest. The full information and sales will be ready in a couple of weeks. You can follow the discussion on The Sagan: A high-end Belgian loafer from Allan Baudoin by entering your email address in the box below. You will then receive an email every time a new comment is added. These will also contain a link to a page where you can stop the alerts, and remove all of your related data from the site. Where did the sweater in your photo come from ? Nice one. Which color is it of the pair in the pictures? I find the similarity to slippers rather off-putting and it makes me wonder what I would actually wear these shoes for? Round the house? Well, maybe, but then why not just keep slippers on in the first place? Casual wear? Possibly, but then why spend £245 on a pair of shoes which will leave most people thinking that you ran out of the house without getting dressed properly this morning? I can see why you’d think that Matt, but I’ve found them extremely useful. Around the house they are much nicer and more elegant than a slipper (as well as better made). Around the office they also work well for me – potentially as an alternative to a dress shoe on a warmer day or when I need one). They are also great for travel – to wear for the hours between arriving at an airport and getting in a cab at the other end. People also unfortunately use far worse shoes for this same purpose, like driving shoes. Which are in no way designed to be used outside and as a result deteriorate quickly. They seem to me actually a great shoe for holidays, light for luggage and a smart evening shoe to compliment the daytime/ poolside sandal or driving loafer. They would also put you a few style notches above the Birkenstock wearer at the table opposite. I’m going to show my ignorance in assuming that these cannot be re-soled? Also, do you have any experience with Edward Green’s Portlands. Are these in any way comparable? These would appear to be £135 cheaper. Yes, they cannot be resoled. I too thought Sagan was a strange name for a Belgian loafer, which I might associate more with Pippo Pozzato. I assume a Sagan would be that shoe that could do everything really well, but only rarely is the absolute best. Or, better yet, a loafer that is getting better with age, and which is excellent for walking up cobbled hills. Simon, thanks for this insightful article. I’ve never seen a pair of Belgian loafers that I thought made any sense, usually due to poor quality and too close a resemblance to house slippers. This shoe may be an exception, at least in your opinion. I notice that the vamp appears to be very low. Is that my imagination or is that just how Belgians are designed? I was just told by B&L that they can make the vamp higher. I don’t agree that they look too much like slippers, the light construction is ideal on a hot day. They seem like good value against the EG Portlands I have, and cover similar ground. Thanks for the post. This seems to be a great choice for a casual-Friday shoe in the office during warmer days. Just an off topic question here – would you still recommend the La Portegna slippers for the time spent in Airports/ Planes? Or would you rather use these for this purpose (please ignore the price difference between these two). Thanks! Very stylish and agree a step up from Rubanacci’s offerings. Would be interested in your review of Allan’s other offerings, mto or bespoke. 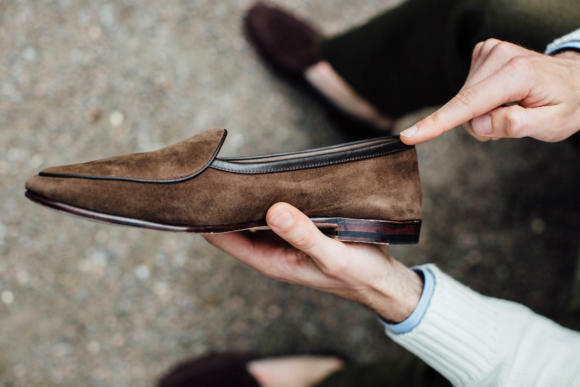 Quick random question for you regarding these types of unlined suede loafers: Would you recommend using shoe trees in them? I recently purchased a pair of unlined suede shoes and am not sure whether shoe trees would stretch and distort the suede over time. These are lovely shoes ineed! Obviously, the usual bows being dumped makes these loafers stand out. And apparently, Allan has done his best to make them harder wearing too. 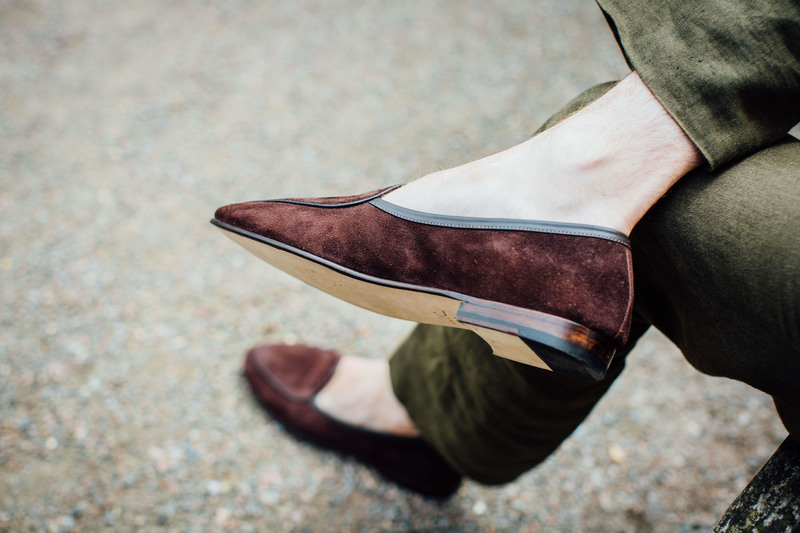 I believe that the best color for suede loafers is dark brown, due to its versality and suitably for Summer. Yes, dark brown is definitely the most useful. Lovely shoes, probably the best option to wear around the city in the warmer months when espadrilles are too informal. Never liked driving shoes due to its shape. Do you happen to know why they are called belgian loafer and what is their origin? I guess a post exclusively devoted to loafers may be of interest to PS readers. I have in mind their varied levels of formality. I know there are French – mind you, they are not alone ! – who would wear a suit with a pair, say, of JM Weston loafers (the famous180), which in my opinion would look way better with denim. 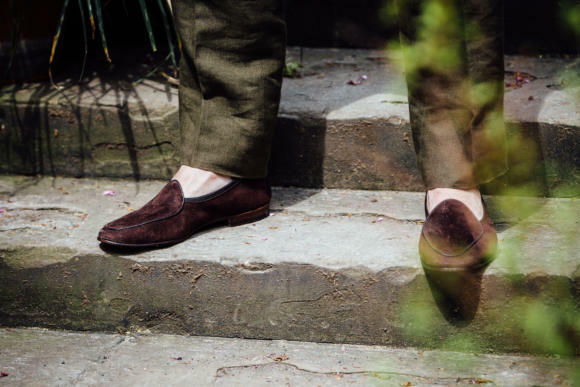 Other loafers – for instance, your recently featured G&G – could easily go along with a casual Summer suit, whereas others couldn’t, and thus would remain within the confines of denim and a like. Yes, I think there are loafers and loafers. What would be your take on this topic? Apologies for the schoolboy error on the sweater. I bought a sweater from A&S several weeks ago and was gently steered away from the cotton one I looked at on the grounds that cotton sweaters do not keep their shape too well. 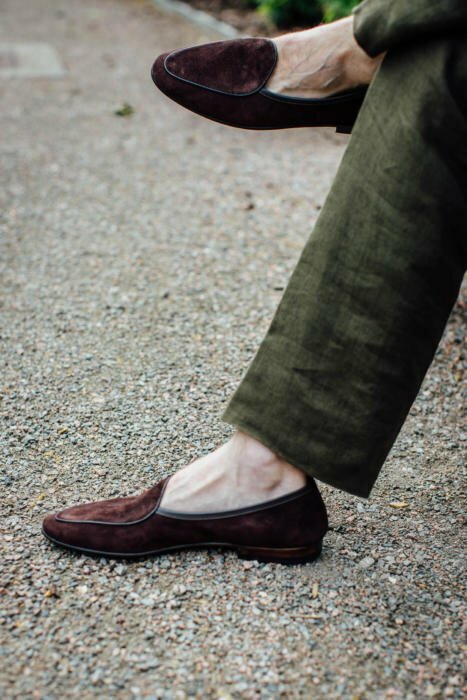 The loafers look superbly constructed, and go so well with your (extremely comfortable-looking and stylish) linen trousers. Thanks for this post! 1. I have particularly narrow feet and wear a B width in Allen-Edmonds (I believe you’ve never tried American shoes, so I know you can’t really compare). Would loafers such as these reshape to my narrow feet, or will they be too large and it is best I steer clear? 2. I’m mostly in need of a shoe I can wear in warm weather outside, though still professional looking. Belgian and Italian loafers are what I’m considering. Given that these cannot be resoled, and given their delicacy overall, am I best to steer clear of these in favour of different options more suited to street use? hoping this thread is still on – could you comment on the difference between these and La Portegna – the Mocassins, not the Slippers – in terms of money per quality? These are far better made. Hard to quantify exact price/quality ratio, but in any case these are much dressier and I would use them as such. PS all threads are always live! After initially thinking I wouldn’t get these, I ended up purchasing. They filled a real need – shoes that can be quickly slipped on and off as I go in and out of the house, yet still look good. They are quote soft like a slipper, with the exception of the heel counter – which helps keep them on. The fit is more that of a slipper than a shoe. I would consider them too short for a shoe (my toes nearly touch the end). However the lambskin is so soft that this hasn’t been a problem – though I wouldn’t wear these all day. Hello Simon. They look great but how true to size are they? I have been recommended to get them as tight as possible as they will stretch due to them being unlined. Thank you in advance. I am going to spring for a pair of these but since I can only afford one pair, I want to be sure I choose the most versataile color. I am stuck between the dark brown Lusitania and the oak brown. I know earlier you said the dark brown is most versatile but is the oak brown dark too? Some photos it looks dark and others somewhat mid brown. Essentially, I would like to be able to wear these with navy and charcoal trousers without too much of a contrast . Your feedback is much appreciated. To wear with navy suits and navy jackets with grey trousers, which leather do you recommend for the dark browns: the suede, smooth nappa or grainy nappa? In which style: tassel, string, penny or classic? Hey Simon, is the colour of the pair you’re wearing ‘Lusitanias dark brown’ or ‘dark brown’? One problem with the Sagan’s is that the vamp is very short and this causes an issue if you have larger feet because when you put them on they look like a women’s shoe. Belgians have a pointier and slightly higher vamp which optically looks better on a larger foot. I checked these out at the recent pop-up and was impressed. I am interested in now buying a pair for next Summer and was wondering whether you would recommend the dark brown or your own special Bark Grey colour? Bear in mind the only other loafers I have are a pair of C&J cavendish in cordovan and some unlined tan Alden pennys. I anticipate wearing them with lightweight summer trousers and linen shorts while on holiday in Europe and perhaps in London on warmer days. Thanks for all that you do! My wedding is in early June, and I am wearing a black double breasted tuxedo. I plan on wearing a Baudoin & Lange loafer, but the trouble is, I can’t decide which style would look best/be the most appropriate. I am debating between the Sagan in black suede with the string bow or black patent leather (no bow). Also, what are your thoughts on wearing a black oxford rather than a loafer? I have very flat feet, and worry that my flat footedness will cause the loafers to loose their shape and end up looking sloppy. Any thoughts/advice/insights are greatly appreciated. Do you wear the Sagans with shorts? I have seen pictures in the blog where you wear suede loafers but not the Sagan. Hi Simon. Have been looking at the Sagans for a while now and am tempted considering the heat right now in the UK. But , they aren’t really my style, can you recommend an alternative, perhaps suede brogues or so. Thanks. Simon,at the risk of losing style points I’ve seen suede moccasins in M&S and Jones The Bootmakers for around £70.I have to admit they look really nice…very similar to Gucci’s in brown,navy and grey.I must say that I’m very tempted to buy a few pairs.I think to myself what is the point of purchasing expensive Sagans that only have a short lifespan when for a fraction of the price I can purchase these inexpensive mocs wear them and then simply buy another pair when needed.Another case of style trumping make(costly make as well). Do you use B&L’s shoe tree for your sagans? Or would it only be necessary for deerskin or the Grand model?